Note: While this review has no spoilers for Deadlocked, it does reference events from Dead Reckoning. Vampire trouble. Werewolf problems. Fairy plotting. Relationship woes. A murder. It must be May, because we only get that mix when it’s time for a new Sookie Stackhouse book. And, yes, the waitress from Bon Temps is caught in the thick of it again. The main plot in Deadlocked focused on someone making trouble for Eric and Sookie — not in a romantic way. The vampire King of Nevada comes to chat with them about Victor’s death (the epic part of Dead Reckoning), and that means party at Eric’s house with humans for snacking. Through a few mixed signals, Sookie arrives late to find Eric indulging in a snack. A two-ey laced with fairy blood. Meaning she’s got a drunk boyfriend to deal with in addition to the emotional slap. But it all gets put on hold when the girl he drank from is found dead in the front lawn. Someone’s determined to make trouble for him on all fronts and make things more complicated for Sookie. Charlaine Harris did the mystery in Deadlocked justice. I never would have guessed who was orchestrating the drama here or that person’s reasons. The murder mystery plot was twist-y and roped in more players than I expected. I’d been let down in the last couple novels on the main plot elements, especially the whodunit, and this time she delivered. On the downside, it took a bit before the book kicked into gear. The first half is more a meandering through Bon Temps. 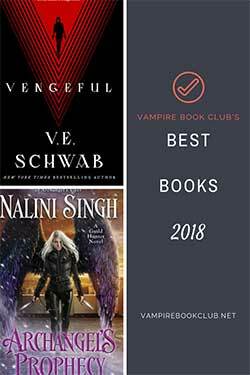 The book checks in with just about everyone you know from the series — including phone call from Quinn, email from Amelia and even quality time with Jane Bodehouse. I love being in Sookie’s world, but it was a bit tedious at times. I kept thinking, aren’t we ever going to talk about that stupid Queen of Louisiana and her silly claim on our Viking, Sookie? Finally, a little over halfway through, that plot thread is picked up. I won’t say it was satisfying, but it moved forward. If you’re into Sookie for the romance, you’ll be disappointed. Eric is rarely on the page, and when he is Sookie is being too stubborn to talk to him. She’s choosing not to tell him information out of spite. She hates him keeping secrets, but refuses to share her own. She recognizes the backwards nature there, but it’s hard to see Sookie so closed off. She used to be much more direct. Mostly her love life end of things frustrated me. That said, the ending brought the “no way!” surprise and I finished Deadlocked with a smile. Is it as good as Dead to the World? No. Is it better than the last two books? Yes. If you’ve stuck with Sookie this long, keep with it. Your review was spot on! You can really feel the distance between Sookie and Eric in this book as Harris begins to wind down the series. It was eviedent when even JANE BODEHOUSE gave Sookie a Bday present and ERIC din’t!. I think it’s evident she won’t end up with Eric but all knew that to begin with….. I wasn’t impressed at all… Not worth the money! For the last couple of books it just seems that Charlaine Harris is bored of writing SVM now. There was hardly any action, no romance… Thoroughly boring and it still left lots of loose ends. No need to apologize for disagreeing. I’m with you that this book wasn’t nearly as good as the early Sookie novels, but in terms of plot it was far more cohesive than the last two. There is only one more book, so much of this felt like set up for real closure. Or so I hope. This book was so full of angst and even though it was sad, it was a good kind of angst. I thought in some areas there was a lot of closure for Sookie, especially in relation to her growth to her character.There was some definite correlation of the Sookie ‘before’ and Sookie ‘after’. I love how much growth she has shown and the only think stopping her from getting the happiness she wants is her stubborness! Your thoughts were spot on, well done! Sadly I think I am ready for this series to end. It just has lost its flare. I am in love with the caracters, but I am so redy for Sooki to find peace in here life. I liked the book but i must say I feel there were so much more to say and I would like to have the last book intwinened in this book and have and end right now. I had an advanced reading copy, so my page numbers are different. But he calls her on her birthday right when she’s visiting the lawyer. I just finished and that is how I expected her to use that gift! I don’t know how she is going to end this but I am still Team Eric all the way…. Iam torn between Sam and Erik, I would love it to work with Erik but it feels like Sam is the one that fits in her life more. I hope she will suprise us all in the final book cant wait. Thats what *I* think should happen. When Sookie Lover mentioned Deadlocked reminding her of a jury, it twigged my memory. Perhaps this is one of the ways the title “Deadlocked” is relevant to the plot: Eric is on trial for killing Victor and the Jury is deadlocked about the verdict. Perhaps, also, someone else Sookie loves is in need of the CD’s intervention. Perhaps Sookie is deadlocked in her decision on who to use the CD for? 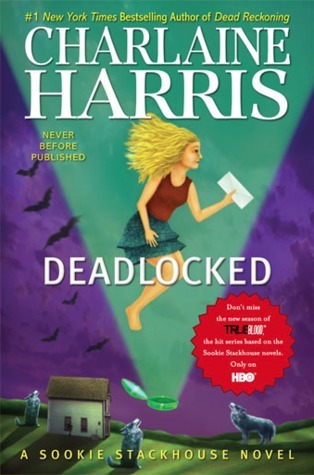 “Deadlocked” is a solid penultimate chapter to the Southern Vampire series — and while the mood is sadder than in the last few books, Charlaine Harris injects plenty of charm into her story. I loved this book. I was late to the series. Got interested when I saw the preview for True Blood. I went and bought the first several books in a set on amazon. Had the whole series up to that point read before True Blood started on TV. I like the tv show and books equally. 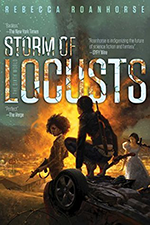 What I enjoyed most in this book is the wind down of the series. You can tell Charlaine is starting to set things in motion to draw the series to a close. Which is great in my opinion because I hate when a series is played out. I will hate not having a new Sookie book every year but it needs to be done. I wish Sookie and Eric would end up together but I think it will be Sam. I have been a fan since book 1. I really love this series, but it has lost something. I did like parts of this book. While it was better, I expect a lot more from a Sookie story. I liked the idea of the murder plot, and the fact that Eric & Sookie’s roles were reversed for it, but it held no surprise for me. I saw the players pulling the strings ahead of time. I got the feeling that Sookie just gave up. She was being a bi**h girlfriend and spiteful, and she knew it. She turned into a total hypocrite. That’s not the Sookie we know & love. The last few pages totally threw me though! I had held out hope that Eric & Sookie would figure something out. I would have given Ms Harris more credit if the character stayed in the situation instead of being rescued. (wow that was hard to say without blatant spoilers) I don’t like the direction Eric & Sookie seem to be headed now. That they might actually get to be happy has been the only thing getting me through the last few books. I feel that since the TV series took off, the books have gone down hill. Overall I was disappointed and let down. My gut reaction at the end was, I hope Felix makes Sookie his toy now that she’s given up on Eric like that. She deserves it. It’s been a month since I finished the book and I don’t feel my stance softening any. I guess my friends were right, Eric has taken Sookie’s place as my favorite character of the series now.